We develop a Fourier method to solve quite general backward stochastic differential equa-tions (BSDEs) with second-order accuracy. 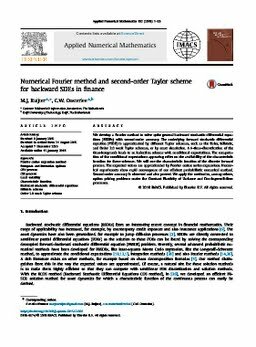 The underlying forward stochastic differential equation (FSDE) is approximated by different Taylor schemes, such as the Euler, Milstein, and Order2.0 weak Taylor schemes, or by exact simulation. A θ-time-discretization of the time-integrands leads to an induction scheme with conditional expectations. The computa-tion of the conditional expectations appearing relies on the availability of the characteristic function for these schemes. We will use the characteristic function of the discrete forward process. The expected values are approximated by Fourier cosine series expansions. Numer-ical experiments show rapid convergence of our efficient probabilistic numerical method. Second-order accuracy is observed and also proved. We apply the method to, among others, option pricing problems under the Constant Elasticity of Variance and Cox–Ingersoll–Ross processes.